Working for the BLM has had it's advantages. It makes people hate me before they even know my name (People in Kanab don't like the BLM very much), I am strangely OK with this. I didn't want to leave any ties in Kanab any way. 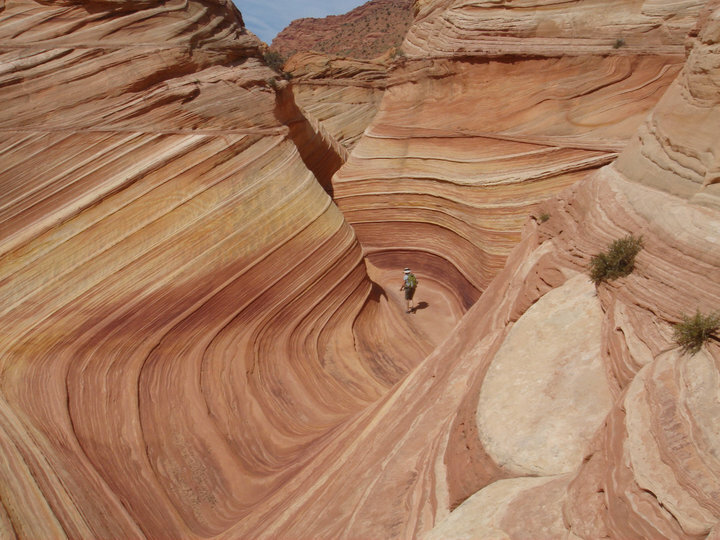 But in all honesty, working for the BLM is great when you want access to areas that most people need permits for, such as The Wave. The BLM only allows 20 people to hike in the Cyote Buttes area surrounding the wave, everyday. People in their 40s cry when they don't win the lottery for a pass. That is how much of a big deal it is. I got to go to the wave last week, sans lottery, with one of my crew members, to "assist" one of the rangers on her patrol to make sure people had water (it was 95F outside. It is a six mile hike round trip) and were legally hiking there with a permit. One of the strange things about The Wave is that when one gets to the trail head there is no one there to check if you have a permit. This makes it possible for any shmoe to hike it, if they feel like breaking the rules. With the hike being so spread out any one could access this area if they really felt like it since it is not patroled every day. Don't get any ideas guys, it is protected for a reason. Seeing the wave made me realize how much I love being out in nature and why I joined the Utah Conservation Corp to begin with. It wasn't so I could go out and ride sick trails all day (I have never wanted to do that). It was so I could connect with the earth and figure out why people really want to save it. Living outside since March has given me ample time to think about why I want to save this big world. It is because I'm not the only one who lives on it and because it is so damn beautiful I often find it hard to describe it. Utah State Rep, Mike Noel, for district #73 was quoted in a High Country News as saying, "Worship the creator, not the creation" when asked about Grand Staircase Escalante. Being of the same religious persuasion as Mike Noel I don't agree with what he is saying. Although I don't think people should worship trees, I know that protecting our public lands is something God would want us (us being EVERYONE)to do. Why else would he give us such amazing unique places on earth? I don't think he did it so we could open uranium mines on them or drill for oil. My days in the surrounding areas of "God's Waiting Room" are numbered, but I am thankful every day that I am there. In the middle of no where. Taking it all in.